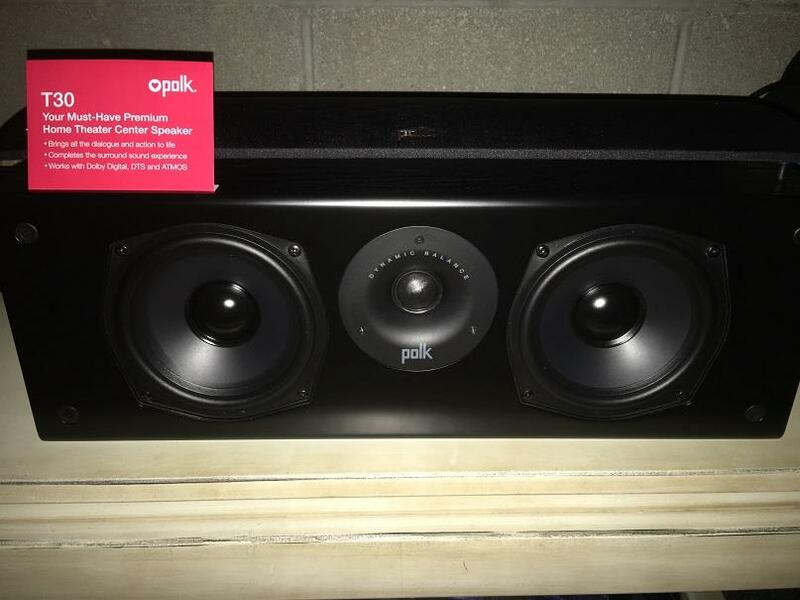 For the first time since I joined GamingNexus back in 2006, I have the chance to review a full-fledged 5.1 Home Theater Audio system courtesy of Polk Audio. Over the last 10 years, I have mainly reviewed speaker bars, 2.1 systems or portable audio solutions alongside the multitude of projectors and TVs. Due to these audio configurations, it has been many years since I actually had a full 5.1 system hooked up to my gaming system and I forgot just how well a powerful speaker system can turn the your gaming experience into something remarkable. 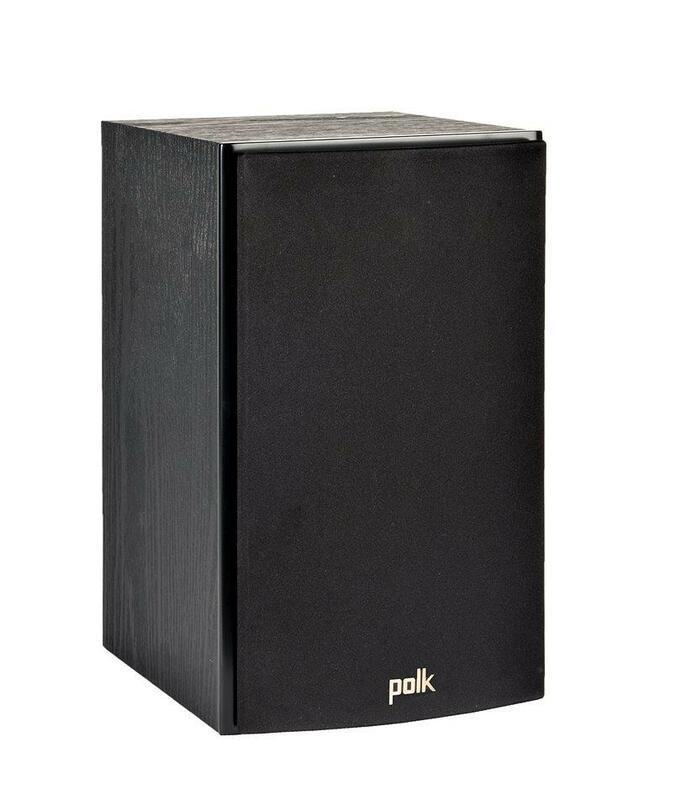 That is where the Polk Audio T-Series lineup comes into play, as this is a classic 5.1 speaker system featuring two towers, two surround bookshelf and one center channel speaker paired with Polk’s PSW108 Sub. 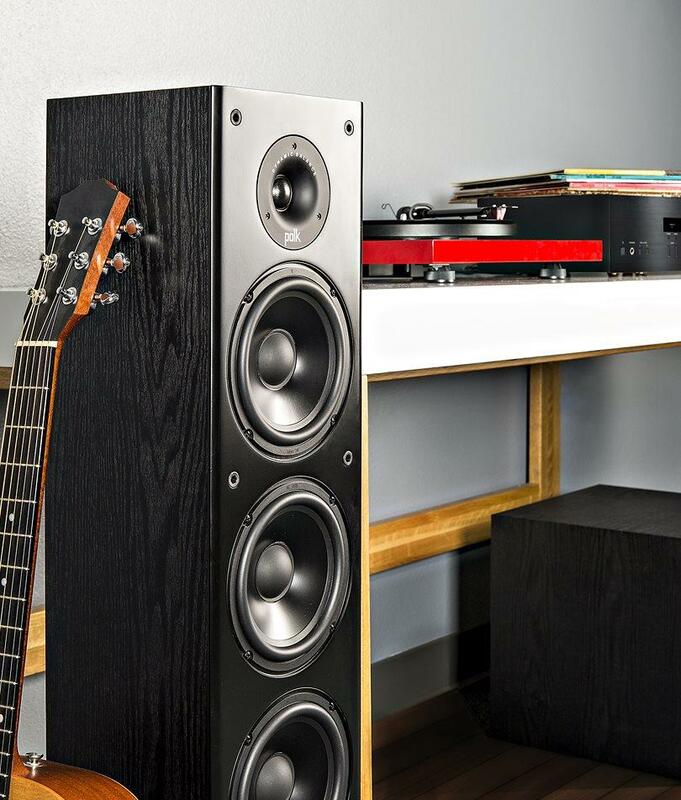 The best thing about Polk Audio’s base T-Series lineup is that it is not only affordable, but looks good and sounds even better. 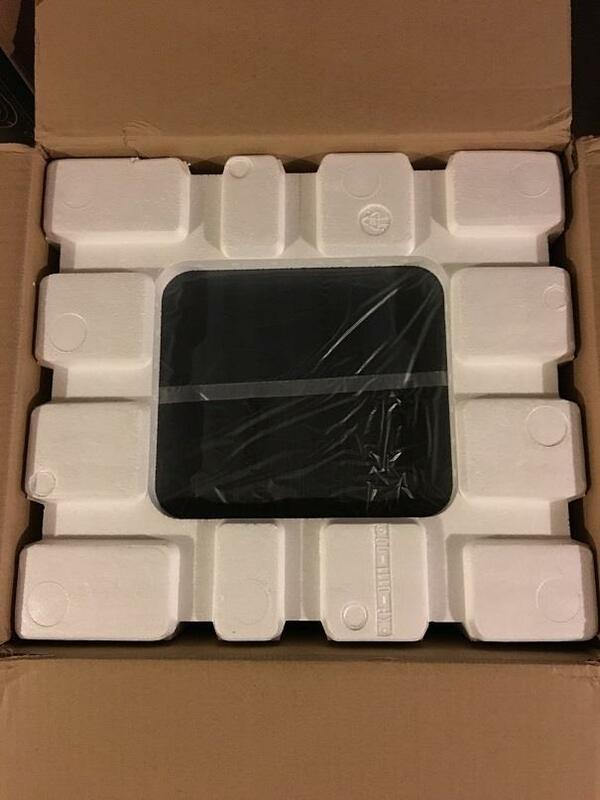 Each speaker was carefully packed in its box with a bag around the unit and tightly wedged within a molded Styrofoam support. 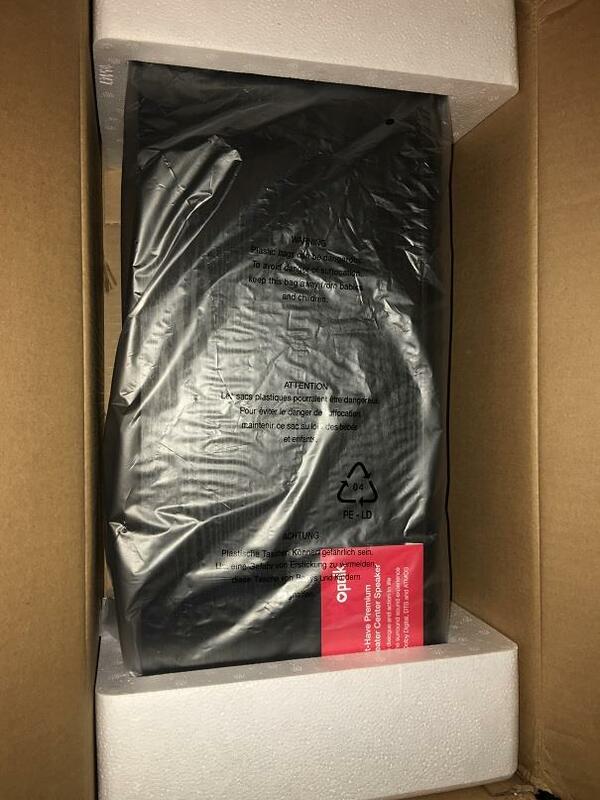 The bag keeps the speaker finish form being damaged by any loose materials, and the supports keeping the speakers away from the direct edges of the box to prevent punctures or drop damage. 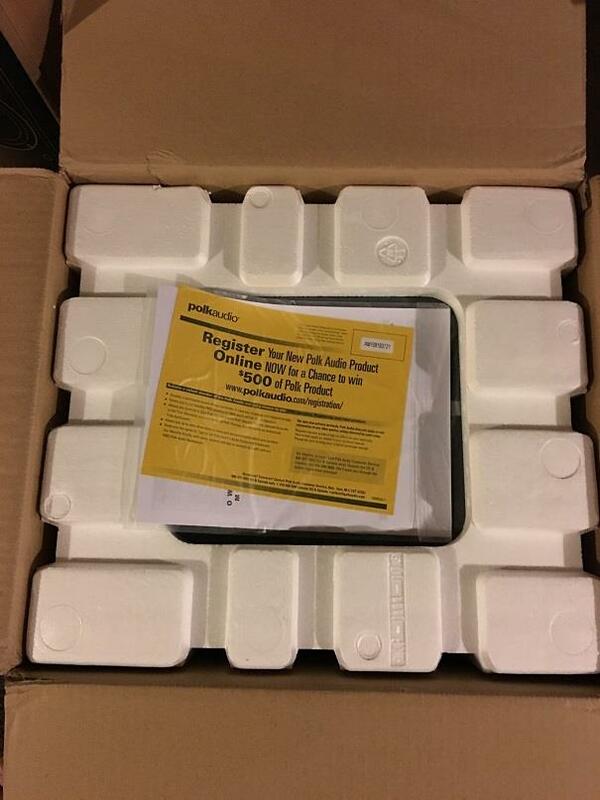 In addition to the speakers, each box holds a manual, registration card and every speaker had a display model card attached to it. 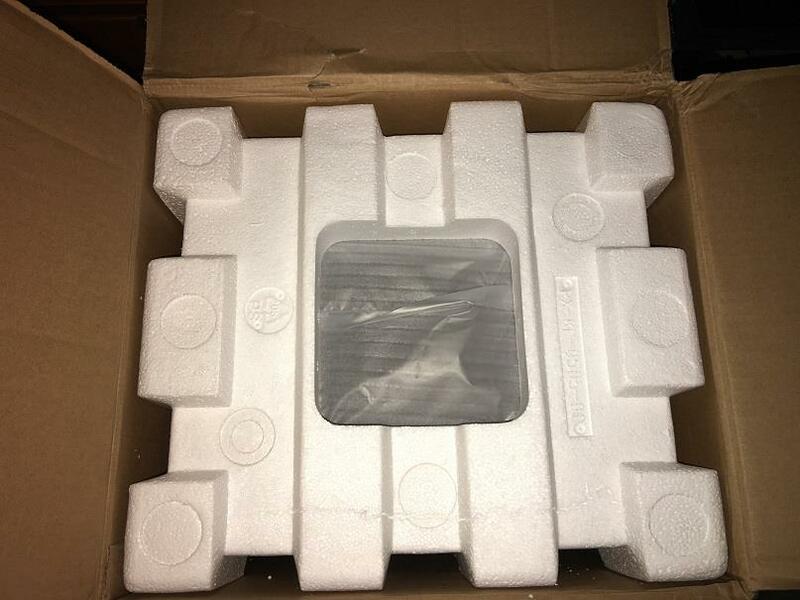 It is no secret that I have always been a fan of Polk Audio, and while unboxing the various T-Series speakers and the PSW108, I was quickly remembered why. 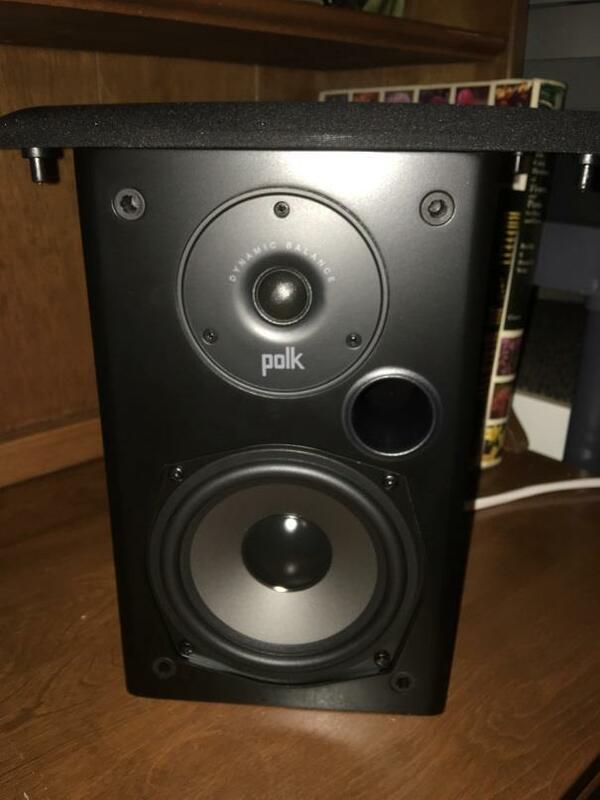 Although these speakers are the base models for Polk and manufactured in China, they still exude the Polk style and quality you pull them out of the boxes and get your first look at them. 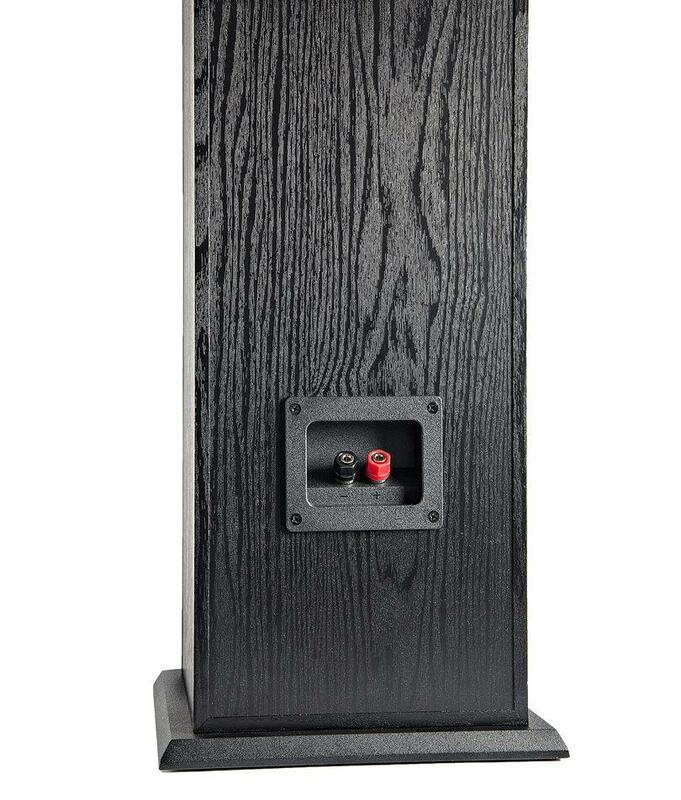 The faux wood grain black finish is reminiscent of models of years past, including previous monitor speaker and their popular S series form the 1990’s. It adds a little more class and touch of realism to the T Series even if it isn’t the same wood veneer used on the higher end models. 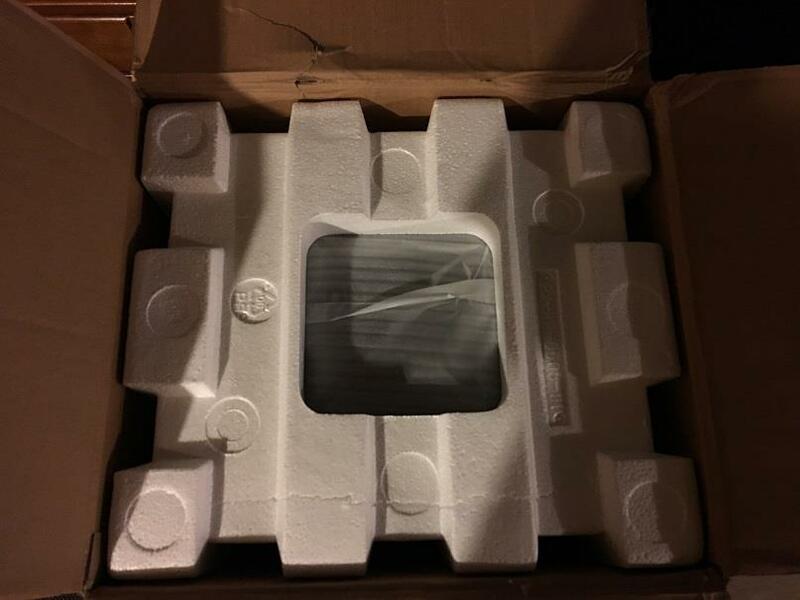 As for the grills, they are cloth black with a simple Polk logo on them that look good whether they are on or taken off to expose the drivers. 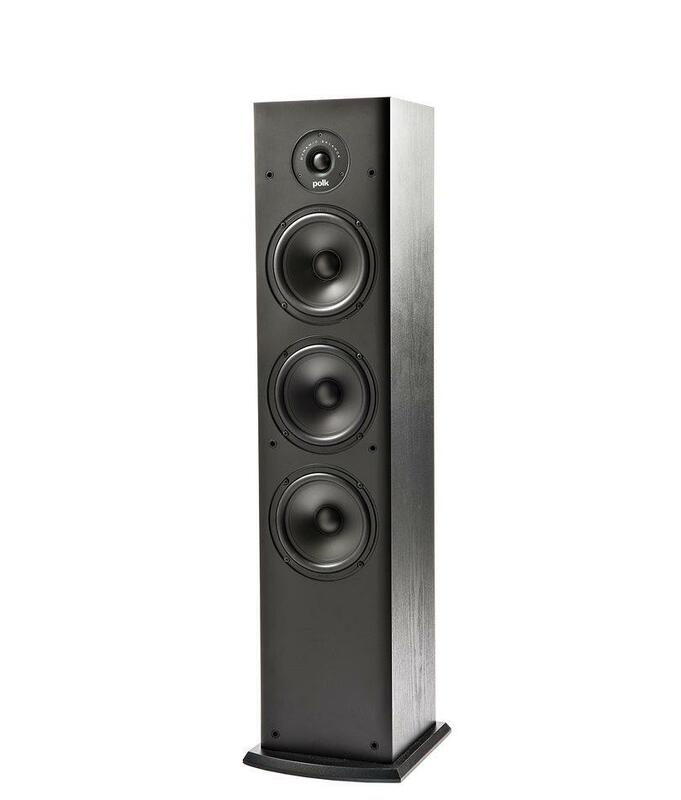 Regardless of whether you choose to rock your speakers with the grills on or off, all five speakers and the PSW108 sub have a really nice look and feel to them that should blend seamlessly into any room in your home and have the look of speakers that are much more expensive. 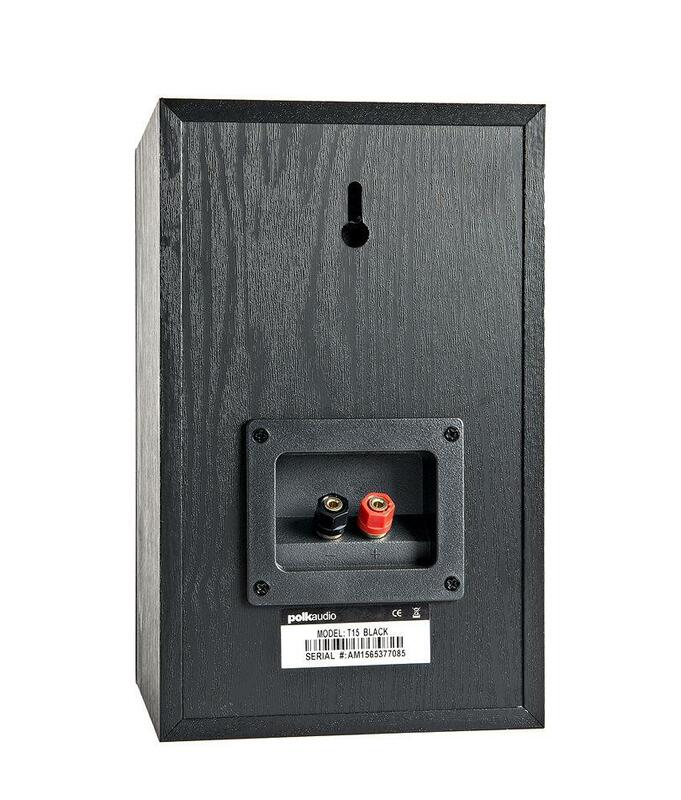 Polk Audio uses two way binding posts on all of the T series speakers, which allow the connection of a bare wire mid-post or a banana plug into the top of the post. 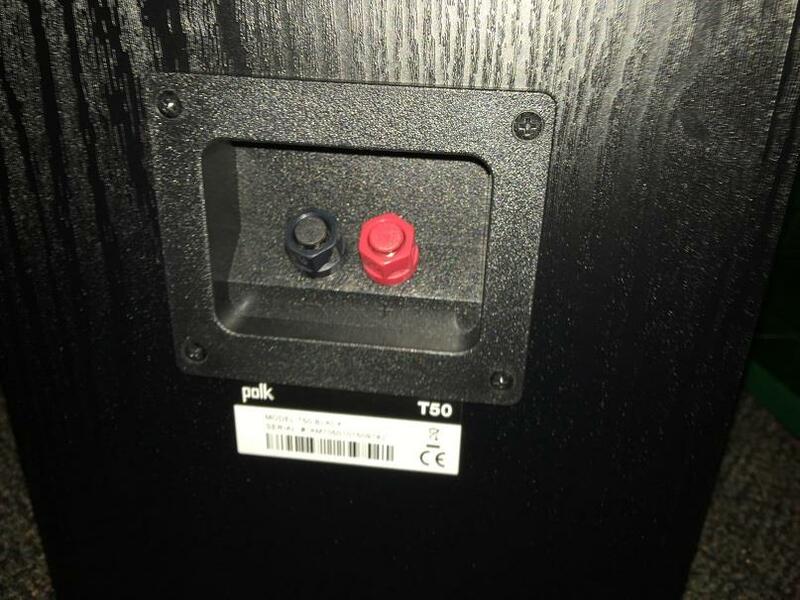 If you choose to use speaker level inputs on the PSW108, then you only have the cheaper spring clips connectors to use. I am not a fan of this type of connection personally, as I prefer to power the speakers directly from the receiver and connect the sub by a sub cable. The great thing about a 5.1 system is that there is a fairly easy and logical way to set one up. The center should be situated directly below (or in some cases above) the center point of your main viewing screen. In my case, it is a 92” Da-Lite projection screen, so I placed the T30 directly below it on a small table about two feet off the floor. As for the front speakers, they should be placed equal distance away and to the outside edges of your screen angled in to meet at the central point of the primary listening area. 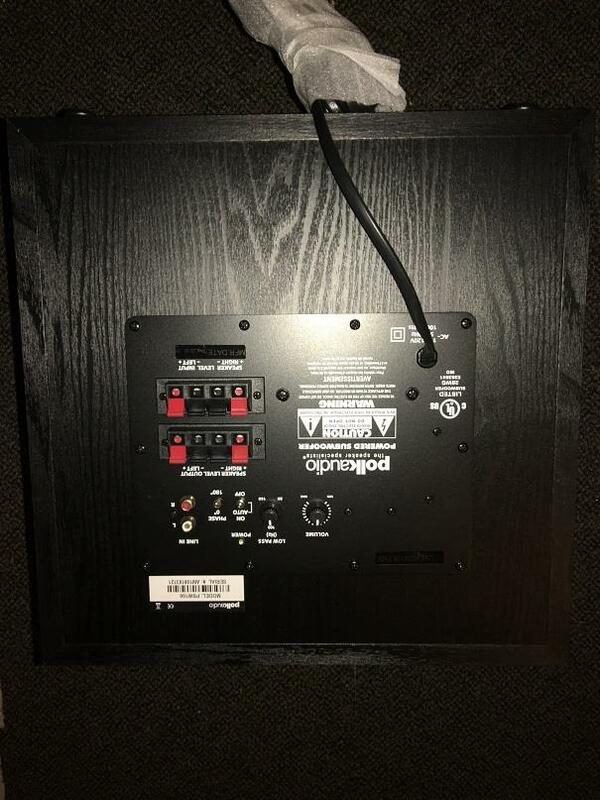 Because the T50’s are tower speakers, I placed them about 9 inches outside the outer edge of the projection screen and angle them directly at the projector (which is currently in a tabletop location). 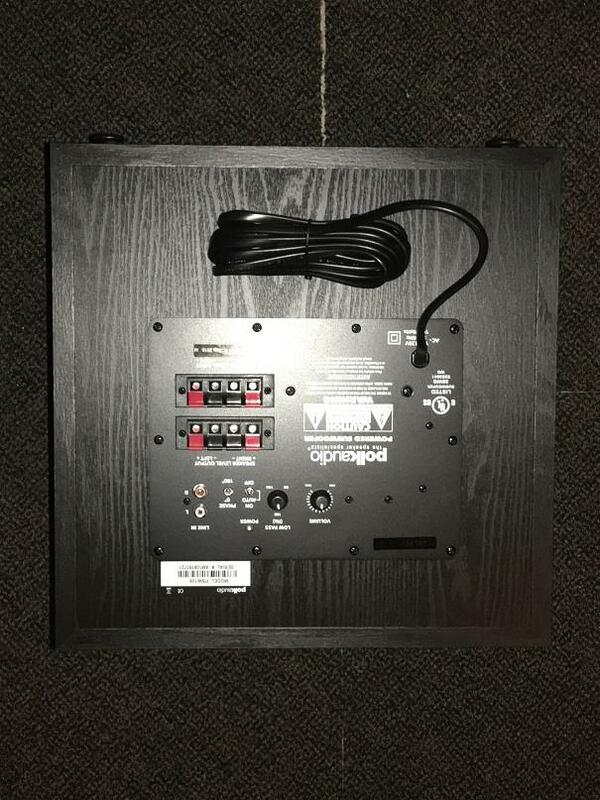 The same basic principles apply for your rear surrounds, with the location behind the main listening area with them angled in along with any elevation angle (depending on where they are mounted) so that they all “meet” at the same spot in the room as the front channel speakers. While this is a very simplistic way of doing this (I would also encourage you use the microphone and tuning options with your receiver if you have it), it is a general rule of thumb to get you going until you get the entire system fine-tuned to your liking. 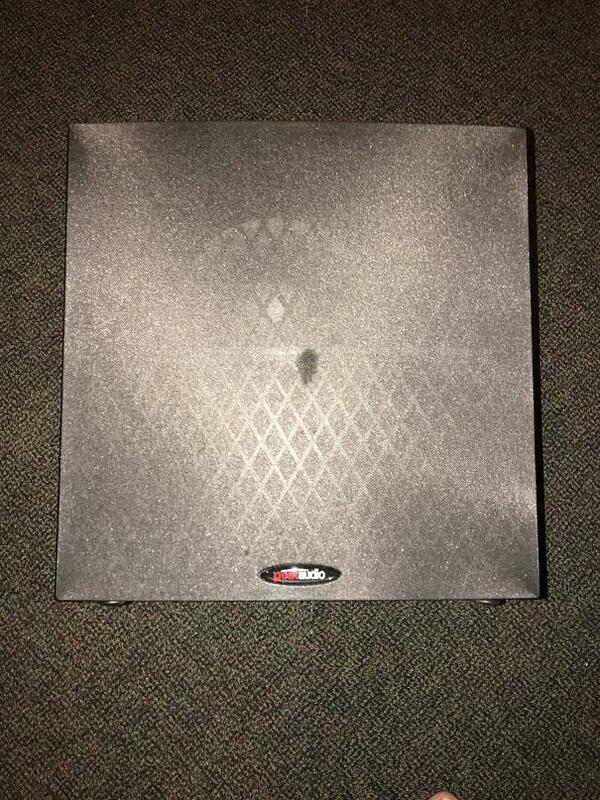 Subwoofers in general are omni directional, so in theory, you can put them anywhere and it will not cause much of an impact to the listening experience. However, two things do come into play, one of which is room aesthetics, and the other is location near walls or other equipment that could be impacted. For the PSW108, I chose a location off to the side of my test lab that happens to also be the corner of the room with two black walls. 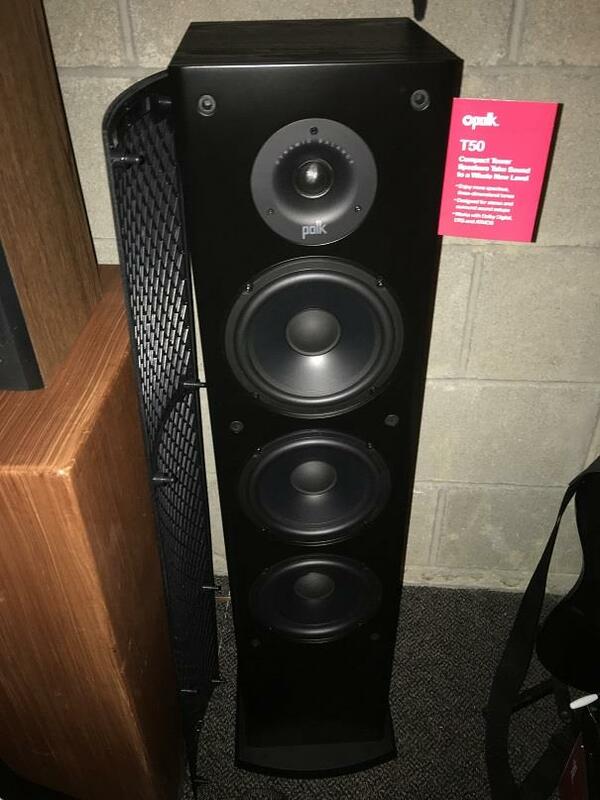 Not only is this out of sight (and mind as far as my wife is concerned), but the right angels of the block meeting help to form a natural amplification of the bass waves and shoot them back into the room. This helps to make the bass seem deeper and louder than it really is, albeit some slight adjustments on the controls to account for this placement will be needed. This location also is also far enough away from my consoles (and their disc readers) and A/V equipment to ensure that we don’t vibrate anything off onto the floor or cause and HDDs to skip and leave a mark. 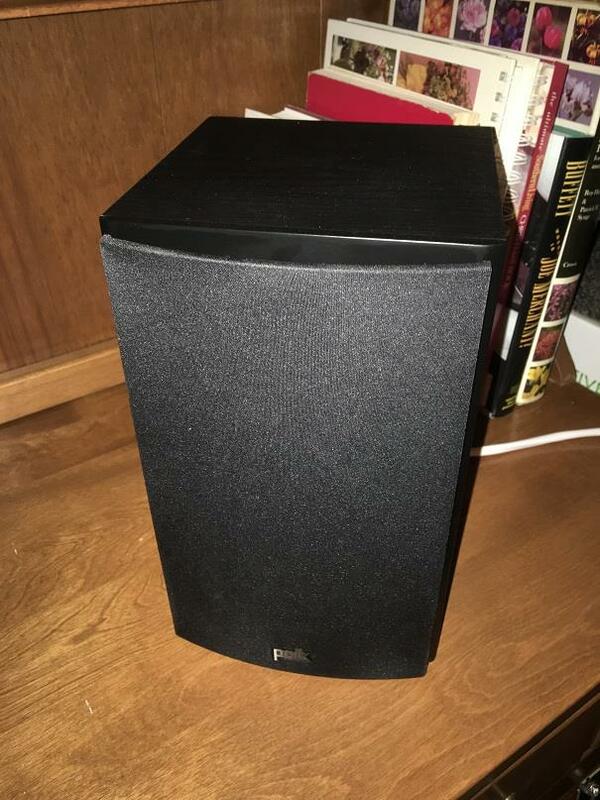 Let me just say, there a couple of things that full-fledged home theater speaker system consisting of separate speakers will get you that speaker bars and speaker systems (five small speakers with a sub) will not: Complete surround sound and the capability to produce audio with brute force. 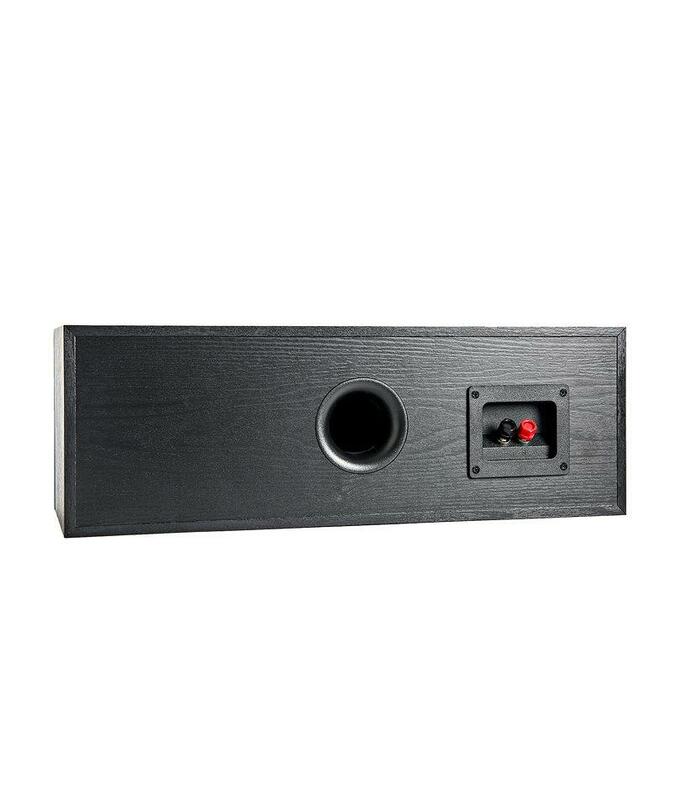 With speaker bars, it is essentially a very compact 3.0 front surround system that tries to emulate rear surround by blending the audio form the three front channels. However it mainly creates a decent sound bubble that rarely gives you detailed rear surround audio. 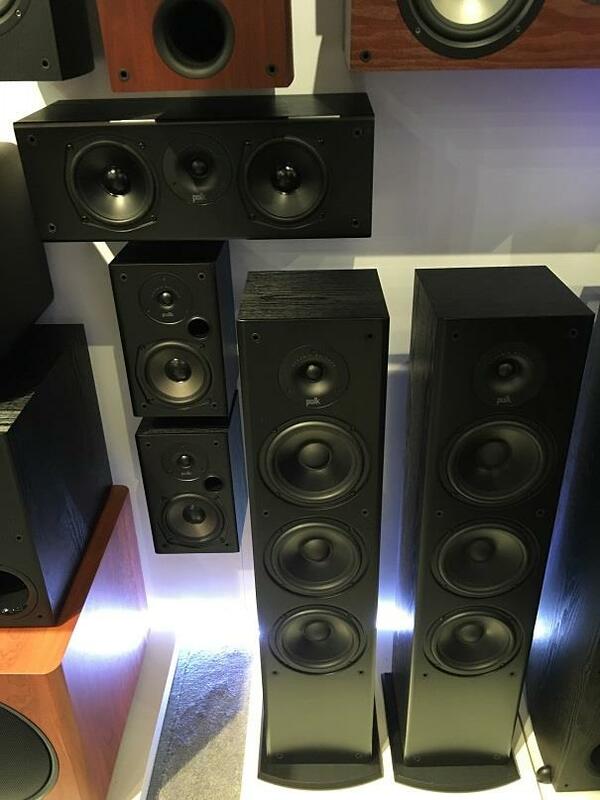 With a 5.1 satellite speaker system, you will hear the rear surround details, but you absolutely lack the full audio range that bookshelf and tower speakers can provide on their own and rely on a subwoofer to full in the gap. While this may actually produce decent audio (my primary home theater system is an Athena 5.1 speaker system), you never get the sense that your home theater system could simply be unleashed and just produce movie theater quality sound and bass. 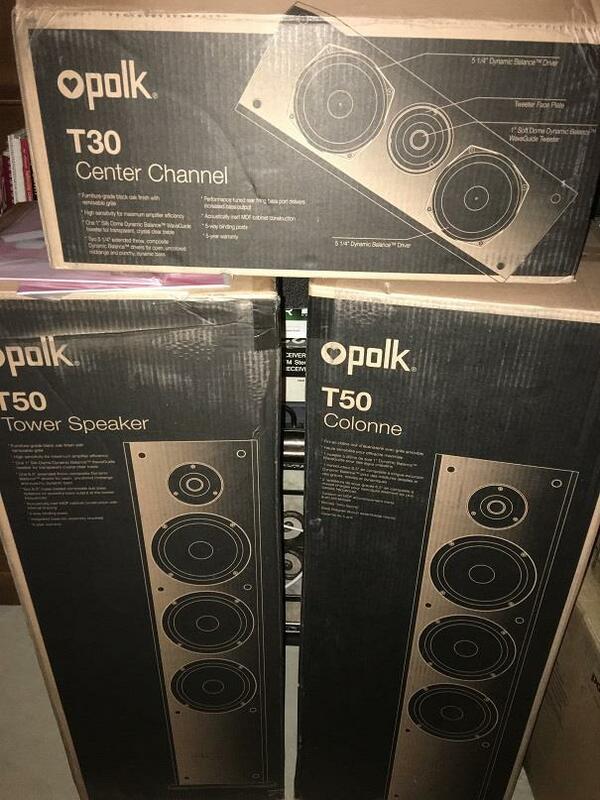 This is where the Polk Audio T-Series Home Theater speakers come into play. 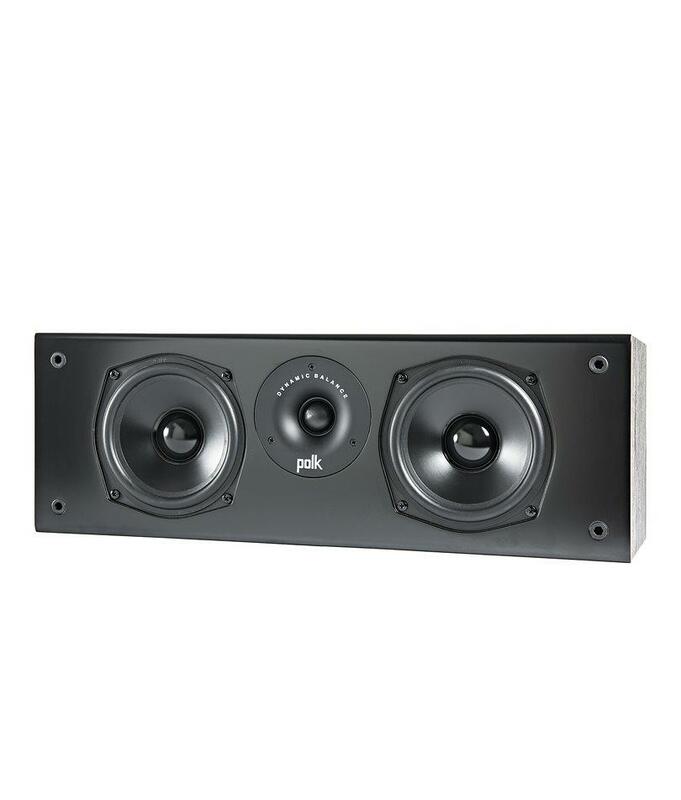 While the T Series is the entry level offering for Polk Audio for standalone Home Theater speakers (they have R, TSx, RTi and LSi series at a higher price), it still provides plenty of quality sound for those not looking to break the bank. 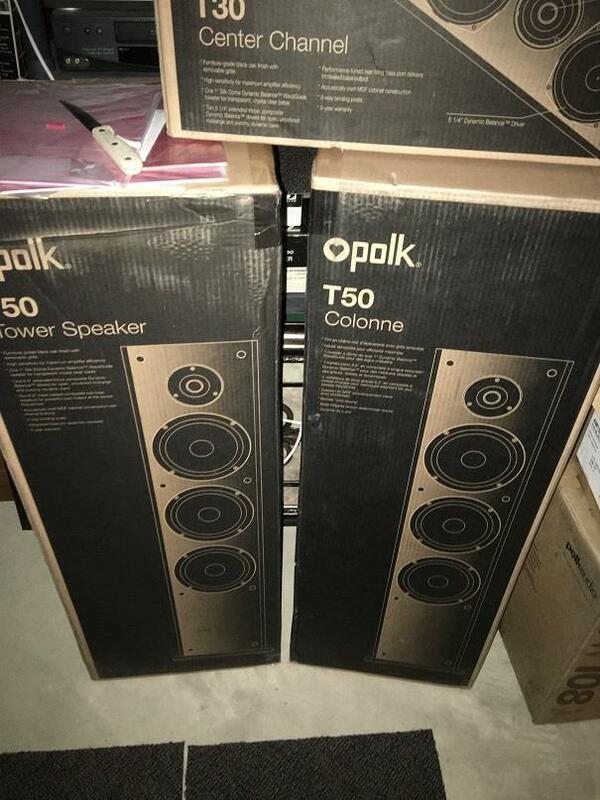 After spending some time with these speakers, I was able to put the through just about any type of scenario that any Average Joe that games and uses their home theater for their entertainment could possibly come up with. I watched quite a bit of TV and multiple movies to get a feel for how well the T Series handled different types of audio soundtracks. For movies, I went with Star Wars: The Force Awakens and two very specific chapters as my test movie. The two chapters “The Falcon Flies Again” and “Resistance to the Rescue” both provide numerous opportunities for full range audio at both ends of the spectrum. The first was when Rey steals the Millennium Falcon and flies it in and out of the Star Destroyer to try and evade the tie fighters. The Polk system did a spectacular job of handling the Falcon and Tie Fighter’s noises, as well as the blaster and explosions. The audio was mixed well by the studio, so the five T0Series speakers and sub were able create an audible cocoon of sounds as Rey whipped the falcon in and out of the various sections of the destroyed ship. The second scene called the “Resistance to the rescue” is where the X-Wing fighters come skimming across the lake to take back what’s left of Maz Kanata’s cantina on Takodana. Between the air battle between the X-Wings and tie fighters, and the ground battle between Han, Chewie and Kylo Ren’s landing party, the T Series delivered incredible and accurate audio that was very reminiscent of what I experienced in the theater on opening weekend. The blasters and battle sounds came in from all directions and once again created a nice envelope of sound that helped immerse you into the scene. I didn’t hear any issues with the T Series trying to reproduce any of the sounds, which left me with the same silly grin on my face when I watched this is the theater months prior. I popped in a few other movies with soundtracks that usually give speakers a test (Guardians of the Galaxy and Fury to name a couple) and was also very happy with the way the T Series rendered the audio. As for TV, I watched a variety of sitcoms, dramas and live sporting events and was equally as happy with the performance as I was with the movie tests. Especially when queuing up some NASCAR, when Fox takes it to their ‘Crank it Up’ section which is zero commentary and all mics form the cars, track and team communications, the T Series was able to flex its raw power and range. For NBA and NHL games, the Polk system also did a nice job of showcasing those background noises from the arenas (such as the vendors, whistles, players and fans) with the secondary audio track. It was clean and came across very pronounced rivaling an experience of sitting a few rows up from the playing surface in any of those arenas. Overall, I was plenty impressed with the way the T Series handled audio for the various movie and TV testing I performed. There were a few instances where maybe the PSW108 was a bit overwhelmed or taxed to its limits, but a quick adjustment of the volume knob to create a better balance with the front and surrounds corrected that issue immediately. While testing the music playback, I spent a little bit of time with the full 5.1 surround music, but I decided to spend most of my time with 2-channel stereo (along with the sub) to see how well the T50’s and PSW108 handled a variety of music genres. Generally, I like to listen to tracks that give me the complete audio range and experience within the same song and allow me to test a speaker’s ability at one time. One such track is Phillip Phillips ‘Home’, which I recently discovered is really good at putting a speaker through the entire audio spectrum. For the T-Series, and the T50s specifically, this meant that the clarity was exceptional from the vocals and guitar to pen the track and the seamless switch to the bass line didn’t muddy any of the audio. The T50’s were able to give me a song that I could listen to at low volume or high volume, close my eyes, and enjoy. Another track that has similar qualities and tested out the same is Kid Rock’s ‘Amen’. Not only could I hear the tambourine that accompanied the song, but when the Gospel Choir The Fisk Jubilee Singers started belting out the chorus, it sent shivers down my spine. Once again the T50’s and PSW108 reproduced the choir’s harmony and vocals in amazing detail with exceptional clarity. After hitting up these two tracks specifically for overall performance, I went through and isolated specific testing sections of other songs to confirm what I was hearing. For Bass lines, I popped in Korn’s “Got the Life” to listen to the deep bass drop about a minute in, JayZ’s “Empire State of Mind”, Flo Rida’s “My House” and “Gold Digger” by Kanye and featuring Jamie Fox. While the PSW108 had a couple of issues hitting the low end of the bass depending on how the track was recorded (not all digital music is recorded equally), I was very pleased with the way the T50s handled the bass lines and testing tracks. There wasn’t any muddiness, nor did I ever feel like I was pushing them to hard. For clarity and accuracy tests, I samples sections from Imagine Dragons “On Top of The World:, Michael Andrews “Mad World”, Crosby, Stills and Nash’s “Southern Cross” and Shinedown’s “Simple Man”. I was once again very pleased with how well the T50s reproduced the music and backing instruments and tracks, as I heard what I was hoping and expecting. Including the clarity of the lead and backing vocals and the preciseness of the, background instruments and Orchestra’s that were in the tracks. After listening to literally hours of music, I will say that if there is a weak link in the playback with the T-Series, it would be the PSW108 sub. The only reason I say this is that I felt it could have gone deeper a few times with some of the music I was testing, and I did bottom out the sub a few times with some of the more intense RAP tracks at high volumes. This wasn’t unexpected, and I was able to quickly remedy it by adjusting the volume dial on the back, but every song (especially digital music) varies in how they are recorded and what emphasis is placed on certain aspects of the music so it would have some additional bass on the lower end of the spectrum. Outside of these couple of challenges with the PSW108, the T-Series created an amazing sound field for the music while sitting within the sweet spot of the speakers, with perfectly balanced audio and clarity that I usually find only in the highest grade studio monitor headphones. 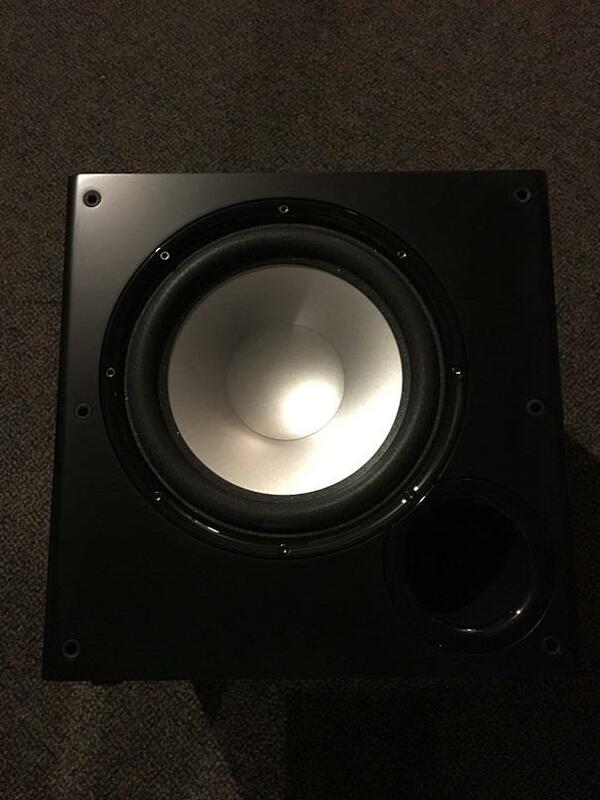 But again, when you have two 6 ½ active drivers and four passive bass radiators along with a 10” sub reproducing your sound along with a couple of Polk’s silk dome tweeters, you should expect great audio. 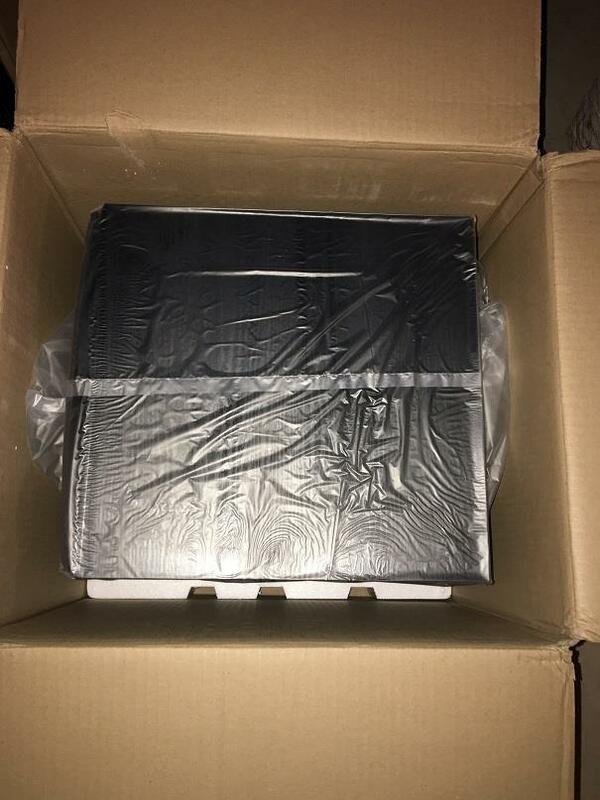 While performing my music and video testing, I was really anxious to take the T-Series through a gauntlet of games that would tell me exactly how well this 5.1 system holds up to the vast speaker bars and satellite speakers I have been testing with games the last 10 years. After about two minutes, I knew I was onto to something special that I had pretty much forgotten about, which was pinpoint sound accuracy that only a 5.1 system can deliver. Although I played many games during my review, the four I will focus on for the audio testing were Fallout 4, Powerstar Golf, Rock Band 4 and Elder Scrolls: Skyrim. First out of the gate for testing was Fallout 4, with testing to see how well the music score and gameplay was handled by a true 5.1 system. Just like a previous review of a speaker bar and subwoofer I did, Fallout 4 offers some of the best game audio testing from my perspective. It all begins with the opening music sequence on the title page, which absolutely burst into my room when played back though the T-Series speakers. That piano track that opens the game sounded incredibly deep and rich, as you might expect while listening through a studio headphones. 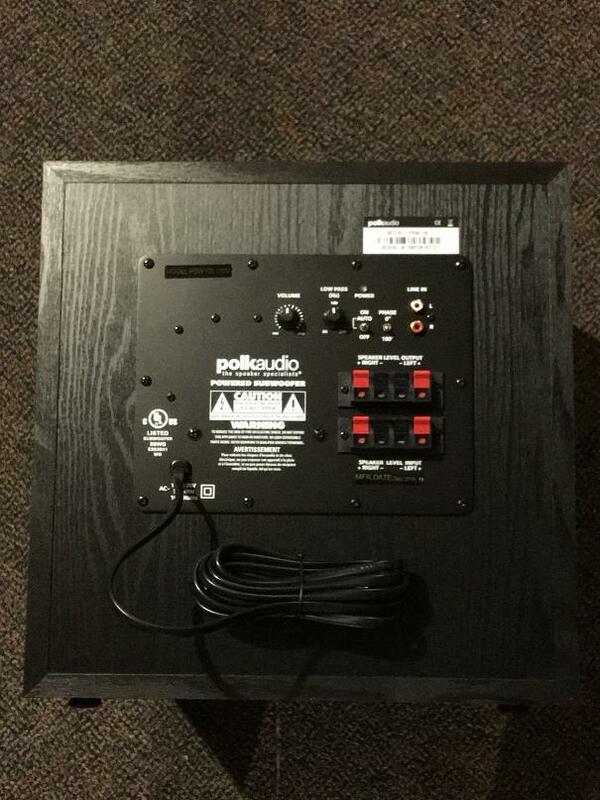 When I switched to Rock Band 4, it was all about the power of the music as it came through the speakers. The vocals and instruments were very crisp and clean, and the volume I was able to crank the game up to (to drown out my singing) while keeping clarity of the audio was exceptional. I heard everything I was expecting and more (including the crowd and background music) from the game to know that the T-Series was reproducing the sounds perfectly and creating that envelope of audio that I was expecting. There really isn’t much you can say about Rock Band 4 audio on your speakers, as they either can or cannot make the game sound good. In this case, it was a definite CAN and I was pleased with the quality that I was able to hear. For my next test, I went with Powerstar Golf on the Xbox One, and even though it isn’t considered an A-list title with a huge development budget, I find that the games golf-course audio and background sounds are perfectly suited as a review title. As I expected, the T-Series rendered the birds chirping, wind rustling and golf sounds (striking the ball, Power Ups, commentary) exceptionally clear and concise. At one point, I closed my eyes while my son was playing and the sounds made me feel like I was in the middle of a golf course (sans the cursing). Throw in the bass performance of the PSW108 and the surround sounds from the T15s and the speakers did a wonderful job of creating that sound field that I listen for when evaluating speakers. Speaking of the surrounds delivering the audio precisely, I stumbled on to a perfect example while playing Skyrim. I was working my way past the Chillfurrow Farm on the Eastern edge of Whiterun and I didn’t notice that Wilmuth was working at the wood chopping block. As I went by, I had my characters back turned to him when he began to chop some wood. Because he was behind me in game, let’s just say that when the sound of the axe splitting the wood came over my back left shoulder, it scared the living daylights out of me as I wasn’t expecting any noises from behind my character. 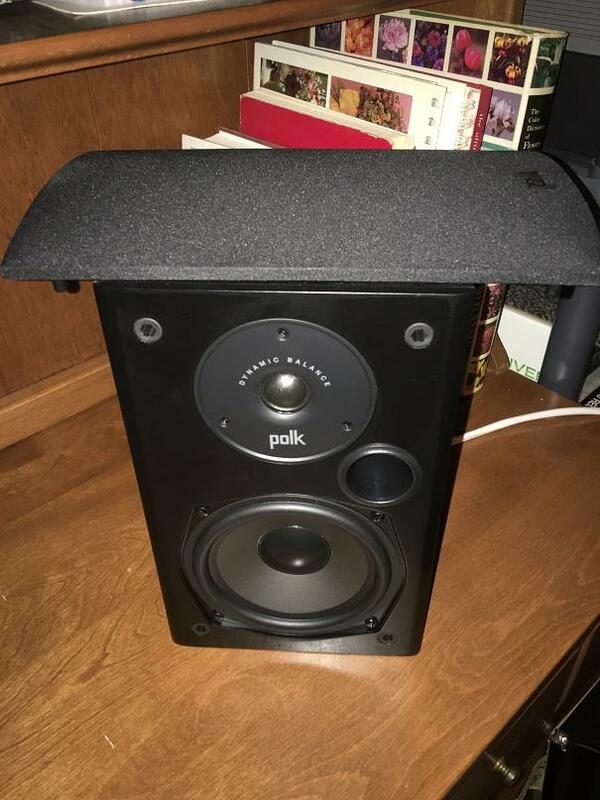 In fact, the Polk Audio T15 surround speakers reproduced the sound so clear and distinct, that I jumped up from my chair to look behind me because I was confused and thought that a cat or a kid had just knocked something over in my lab instead of the sound coming from the game. It was that realistic. After testing on many games included the four mentioned above, I now remember why I personally prefer a full 5.1 system to just a 2.1 speaker bar or other smaller alternatives. There really is no substituting the pinpoint audio placement that a 5.1 system can deliver while gaming. This type of setup can mean the difference between identifying that someone is sneaking up behind you to kill you or knowing specifically that they are coming in in slightly behind and to your left. Overall, the T-Series did a wonderful job of playback of all of the game soundtracks and in-game audio that I threw at it. The Rock Band playback was amazing along with the multiple RPGs and arcade titles. Per my ears, nothing was missed and the Polk’s were able to easily render any and all sounds that the game devs has in them. I was particularly impressed with games that had soundtracks with lots of clarity, such as Powerstar Golf and how well it made you feel like you were in the game. The same can also be said for titles like Call of Duty or Gears of War, Titanfall or any other RPG where there is tons of on-screen action and audio going on at any one time. 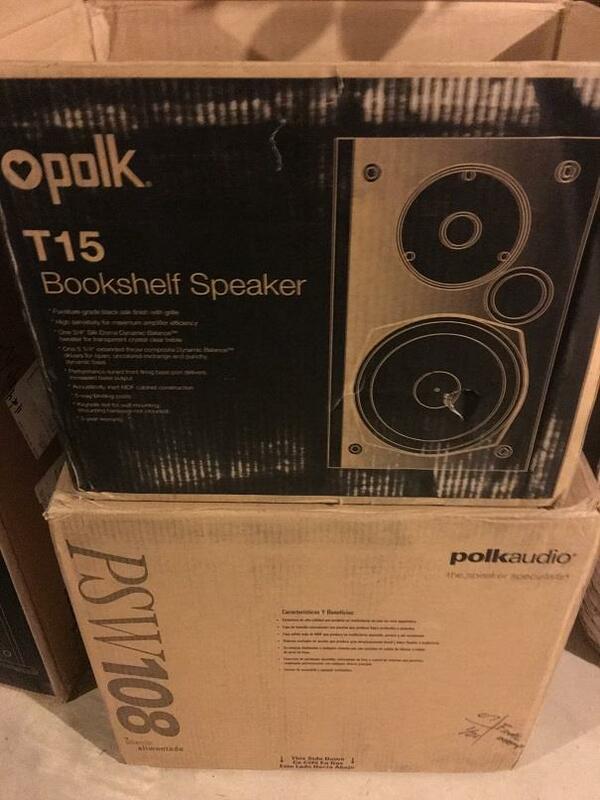 In all instances, the T-Series Polk speakers were able to flawlessly deliver what my ears were expecting to hear. 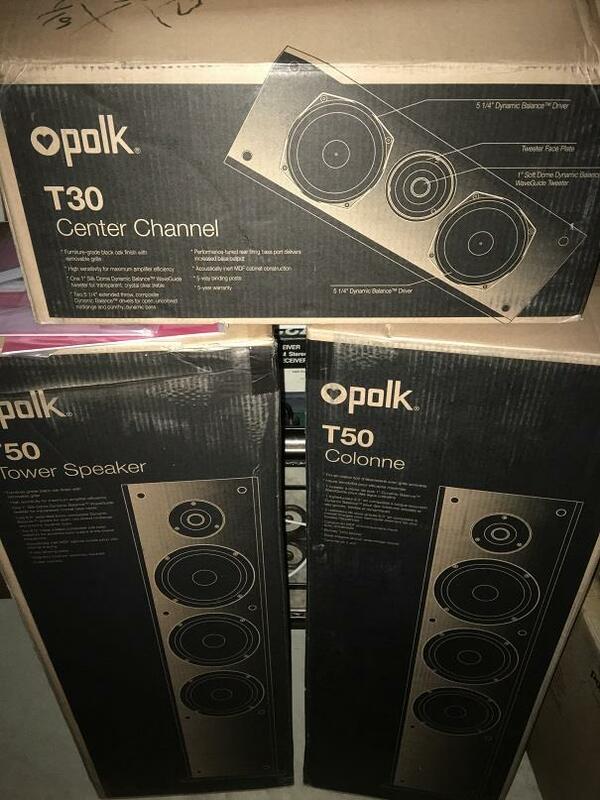 The Polk Audio T-Series 5.1 Home Theater speaker collection is one of the best and affordable systems you can purchase to meet all of your needs. Not only does it look good, but it sounds spectacular and can handle anything that your throw at it from a gaming, music or movie perspective. While the recent trends have seen a shift away from the big home theater speakers to smaller sound bars and satellites, there is something to be said for setting up a system that can generate enough raw power to truly give you an immersive audio experience. 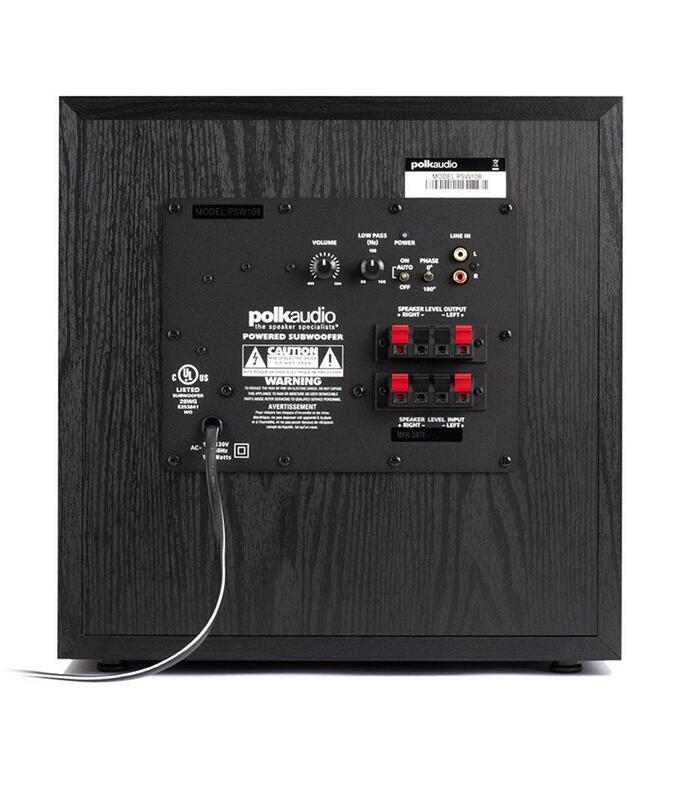 If it is within your budget and you have the space, the T-Series from Polk Audio allows you to put together an excellent 5.1 Home Theater surround system for around $800 when combining the five T-Series Speakers (T50, T30, T15 ) with the Polk PSW108 subwoofer. 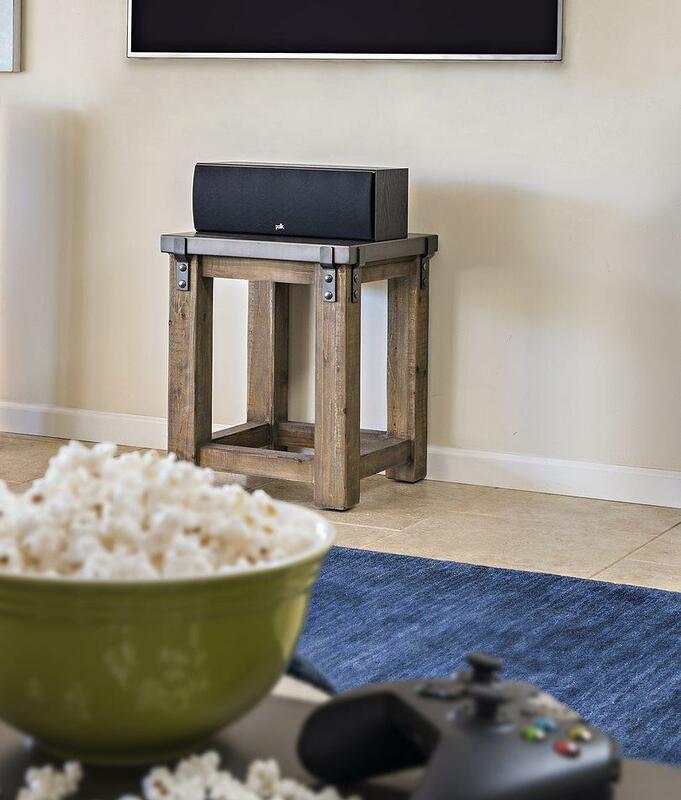 The Polk Audio T-Series Home Theater speaker collection enables you to have both an affordable and hi-quality listening experience from a 5.1 speaker system. 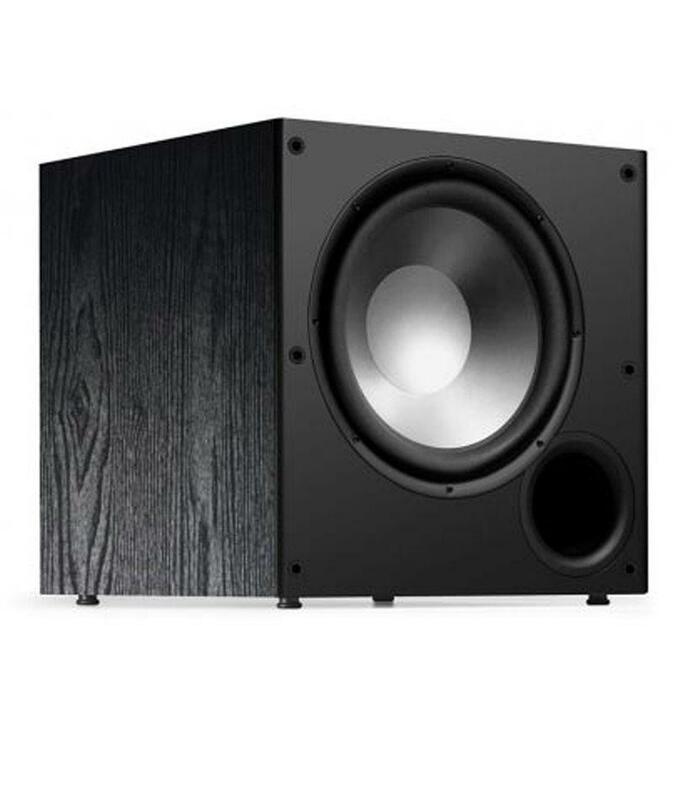 The amount of raw power and sound than the system produces, coupled with its audio quality and unassuming style make an excellent choice for those looking to add big, clear sound to their Home Theater experience for around $800.